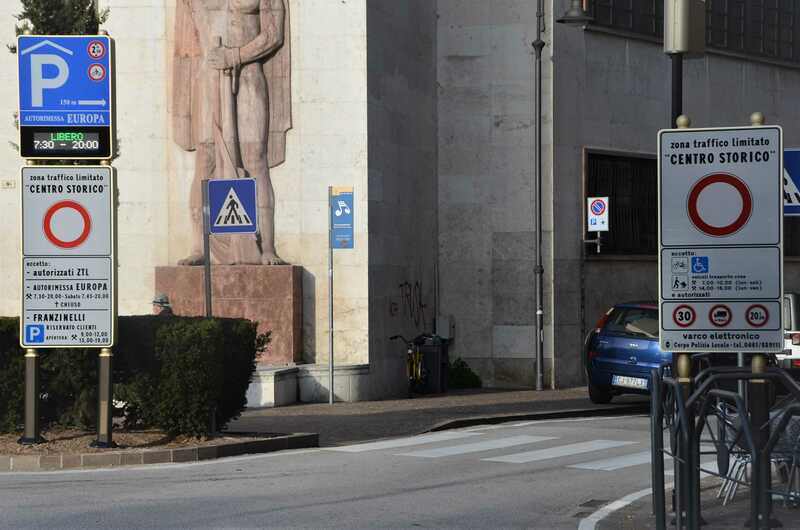 no entry ban, the transit is authorized in order to reach the parking using the Via Galileo Galilei access (roundabout largo Porta Nuova fountain). The license plates numbers of the cars staying in the Autorimessa Europa will be send to the system automatically, hence they will be deleted by the list of the ones passing from the Via Galileo Galilei crossing without permission. Near the crossing there is a signal showing information about the available parking lots and some service information as well (timetable etc). In the parking, the license plate number of the cars is registered immediately when collecting the entrance ticket. The client must verify, under his/her responsibility, whether it is correct or not. At the time of payment, the client receives a receipt with the license plate number of the car. The receipt has to be kept for at least 90 or 150 days (legal deadline) in order to avoid sanctioning mistakes. Please remember that the key of the cars have to be consigned to the staff; vehicles with protruding objects are not accepted (i.e. folded or not folded bike racks); we do not guarantee the availability of parking spots for very big vehicles (SUV, vans, minibuses); please check the availability of parking spots and the opening times on our dashboard, which is located in correspondence with the related Limited Traffic Zone (Z.T.L.) crossing. For any information, please contact our office.